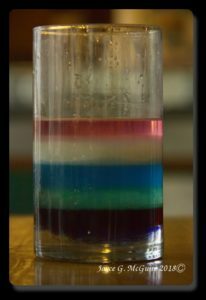 We made a density experiment were we put some different weighted liquids on top of each other and see what goes on what. The first time we did it we put in; fake maple syrup, corn syrup, milk, soup, water and rubbing alcohol. The milk messed it up. We think it was too light because it was 2% milk. And we realized the fake maple syrup went over the corn syrup. 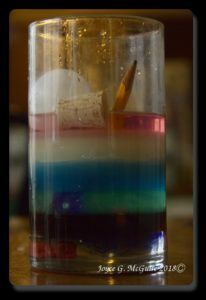 After we layered the liquids we put in the objects. We put in a ping-pong ball, a cork, a die, a pencil, a popcorn kernel, a bead, a eraser, and a ring. I thought it was neat to see how everything “floated”. Just curious to know if you drank your experiment after making it.